The Monument to a Century of Flight is maintained as a public park. The monument's essential structure consists of fourteen wing-shaped stainless steel pylons ascending in height from 10 feet to 20 feet in an orbit of 120 feet, the distance traveled by the Wright brothers in their "first" flight on December 17, 1903. One side is curved to correlate with a wing foil while the flat faces showcase black granite panels that list defining moments in aviation history. Each granite panel has one or two incised images of the men, women and air or space craft associated with these accomplishments. They begin with the first flight in 1903 and culminate 100 years later with the occupation of the International Space Station. Inside the orbit of pylons and surrounding a center bronze dome, is a courtyard of 4,600 bricks and granite pavers engraved with messages of sponsors from around the world. The bronze dome, six feet in diameter, depicts the earth’s continents joined by a centennial message coming from Kitty Hawk. The bottom is rimmed with likenesses of a variety of aircraft: helicopter, hot air balloon, jet plane, blimp and fighter planes. Just outside of the courtyard is a memorial bench of black granite to Icarus International, the primary memorial sponsor, and to the associates of Parker Monuments. The Monument is maintained as a public park, open and accessible to all without admission charge. At the monument entrance is a granite marker inscribed with the poem “High Flight” by James G. Magee, Jr. a World War II fighter pilot who wrote the poem at age 19 shortly before his death in combat over England. Inside this marker is a time capsule placed by the First Flight Club of Rotary International to be opened in 2103. HUMANKIND IS A CONTINUUM OF PIONEERS / SHARING TIMELESS DREAMS / AND THE BOUNDLESS POSSIBILITIES OF VAST / UNEXPLORED WORLDS. High Flight: HIGH FLIGHT / JOHN H. MAGEE, JR. /OH! I HAVE SLIPPED THE SURLY BONDS OF EARTH, /AND DANCED THE SKIES ON LAUGHTER-SILVERED WINGS; / SUNWARD I'VE CLIMBED, AND JOINED THE TUMBLING MIRTH / OF SUN-SPLIT CLOUDS, --AND DONE A HUNDRED THINGS / YOU HAVE NOT DREAMED OF --WHEELED AND SOARED AND SWUNG / HIGH IN THE SUNLIT SILENCE. HOV'RING THERE / I'VE CHASED THE SHOUTING WIND ALONG, AND FLUNG / MY EAGER CRAFT THROUGH FOOTLESS HALLS OF AIR... / UP, UP THE LONG, DELIRIOUS, BURNING BLUE / I'VE TOPPED THE WIND-SWEPT HEIGHTS WITH EASY GRACE / WHERE NEVER LARK OR EVEN EAGLE FLEW -- / AND, WHILE WITH SILENT LIFTING / MIND I'VE TROD / THE HIGH UNSURPASSED SANCTITY OF SPACE, / PUT OUT MY HAND, AND TOUCHED THE FACE OF GOD. JOHN G. MAGEE, JR., A 19-YEAR-OLD AMERICAN SERVING / WITH THE ROYAL CANADIAN AIR FORCE IN BRITAIN, WROTE / “HIGH FLIGHT” IN LATER 1941. HE WAS KILLED THAT DECEMBER / IN HIS SPITFIRE OVER ENGLAND. MESSAGE TO THE PEOPLE OF 2103 / NEAR THIS MARKER IS A TIME CAPSULE DEDICATED TO YOU. / IT WAS PLACED BY THE FIRST FLIGHT CLUB OF ROTARY / INTERNATIONAL UNDER THE SPONSORSHIP OF THE BANK OF / CURRITUCK HONORING THEIR PRESIDENT AND CEO, / SAM T. “TOMMY” MOORE, JR. PLEASE OPEN IN / DECEMBER OF 2013. Over 600 people were in attendance for the dedication. Tom Poberezny, President of the Experimental Aircraft Association, delivered the keynote address. Joining in the ribbon cutting with Poberezny were NC State Senator and President Pro Tempore of the NC Senate, Marc Basnight; Chairman of the Dare County Board of Commissioners, Warren Judge; Outer Banks Visitors Bureau Managing Director, Carolyn McCormick; Kitty Hawk Mayor, Bill Harris; Chairman of the NC First Flight Centennial Commission and First Flight Society, Ken Mann; and President of the Board of Directors of Icarus International, Bill Kealy. Granite panels, inscribed bricks and granite paving stones: Parker Monuments, Knightdale, NC. Steel pylon fabrication, casting of bronze center dome: Jubran’s studio, Grimesland, NC. 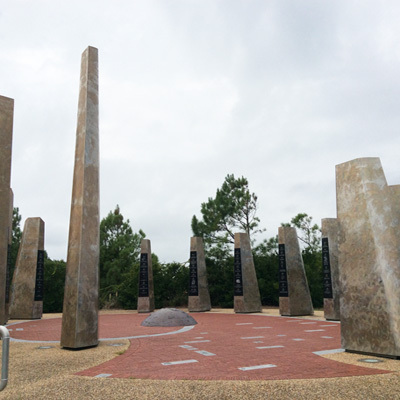 The design evolved out of the collaborative efforts of Outer Banks artist Glen Eure and Hanna Jubran and Jodi Hollnagel Jubran, two acclaimed artistic and historical commemorative landscape of North Carolina. Over 30 of their works dot the landscape to include Western North Carolina Veterans Memorial in Asheville, Time Capsule Sculpture and Benches in Kinston, Nooherooka Monument in Snow Hill, and Pee Dee the Pirate at ECU in Greenville. They are both employed by the School of Art and Design at East Carolina University. 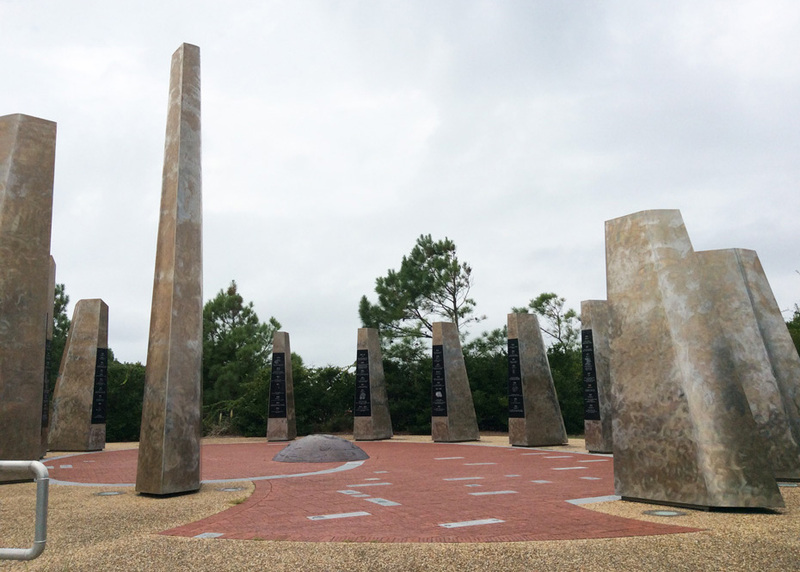 The Monument is situated on a high hill overlooking the ocean and the Aycock Brown Welcome Center, 5230 N. Croatan Highway , just over the Wright Memorial Bridge to the Outer Banks. It is a public park open and accessible to all without admission. It is surrounded by the simple beauty of the barrier island's natural vegetation and looks out toward the waters of the Atlantic.